The pseudo-live coverage of the final table will be on ESPN3, which means if your ISP does not provide it (or you live outside the US) then its fairly likely you will not be able to watch the proceedings short of proxies/other hackery. Obviously it will not have hole cards (Ty mentioned that Nevada is more “conservative” than Europe in that regard), but it will have community cards and a video stream. James Hartigan will provide the play-by-play and pros will provide additional commentary (which means, basically, they are doing a very similar format to the EPT Live coverage, right down to the commentators). Mizrachi is on a lot of poker media member’s minds: including his tax issues. ESPN noted that while they are talking about it, but its not a big part and they are dealing with the “Year of the Mizrachis” angle, at least they had been until the final table. Some of the storylines of the final table: youth of the table + the experience of the players + the international flavor of the FT (even if the majority of players are American, some players were born elsewhere). Changes to the Penn + Teller Theater: More seats to the public, fewer seats to friends and family. Editing the final table is pretty much a non-stop endeavor, and they actually record voiceovers for more hands than actually get shown depending on how the story of the final table plays out. Voicing gets finished while the 1st hour of the final table coverage is already on the air. The NGC, Harrah’s, and federal regulators feel like online poker is illegal, according to Ty Stewart (but for some reason have no problem taking ad dollars from said people). Some pretty important topics were addressed (how ESPN is going to deal with Mizrachi’s tax problems, how FTP is going to deal with its push to actually get a main event champ in the stable, etc.) and as the November Nine gets closer some of these may come more into focus. EPT London :: Day 1a of Â£5,000 Main Event starts Wednesday, EPT London Schedule PokerNews and PokerStars blog cover all the action. Streaming of the final table, with hole cards, on a five-hour delay will be available at www.espn3.com and www.wsop.com for European viewers. For those looking to follow the action live, PokerNews and WSOP.com will constantly be providing live updates. TJ Cloutier Choctaw Poker Classic – Durant, OK :: Sudhakara Kattamuri takes down the $1,500 + 100 Main Event for $73,127. Big Poker Oktober – Bicycle Casino :: Small buy-in series of tournaments through Oct. 9, NAPT in November. PokerStars WCOOP $5k Main Event: Under 125 players remaining, one of them tbvle, winner of hand 50,000,000,000 on PokerStars at a 2/5 cent table, which included a WCOOP Main Event ticket. He’s turned that into at least $17,711 and is looking for more. The PokerStars blog is providing live updates as they play down to a winner by Tuesday morning. The Detox Poker Series on Saturday Day 1b of the $550 NL Holdem – $200,000 Guarantee drew a field of 228 players on Saturday creating a total field of 433 entrants for a prize pool of $216,500. The final 27 players made the money, with some of the notables who cashed yesterday: Alex Outhred and David Tuthill (both earning $1,200), David “The Maven” Chicotsky and WSOP photographer Rob Gracie (each collecting $800). The full list of results and payouts are available at the Detox Poker site here. The final tournament of the series starts at 5pm, the Player Appreciation w/ $50 rebuys tournament with $5,000 added to the prize pool. The tournament is available exclusively to players who present three tournament receipts from the Detox Poker Series. Players start with 2,000 in chips, with $50 rebuys available when your stack is 2,000 or lower. At the end of level three, a $50 add-on is available to add 4,000 chips to your stack. Be sure to check out www.DetoxPoker.com for updates, videos and more as the Detox Poker Series concludes. Wednesday’s tournament action at the Detox Poker Series at the Hard Rock Hotel was good for those who like overlays in guaranteed tournaments, while the founder of the Pokerati Game almost won his own tournament. Full results and pictures can be found at the Detox Poker site here. Event #11, the $230 Pokerati Game w/ 1 $200 rebuy, consisting of 9 hands of NL Holdem followed by 9 hands of PLO, drew a field of 31 entrants, with the final five making the money. In what surely was a surprise to all involved, Pokerati.com founder Dan Michalski nearly won his own tournament, finishing 2nd to Lev Serzhenko in heads-up play. Serzhenko collects $5,184, along with sash for the win. Michalski earned $2,880 for the runner up finish with Darryl Dauenhauer (3rd $1,728), Aria poker room manager Adam Altwies (4th for $1,152) and Carol Kline ($576) completing the list of players making the money. More pictures of the winner and Michalski here. One tournament takes place at 1pm this afternoon with another $350 NL Holdem event, with two $140 Mega Satellites scheduled for 5 and 9pm, each with 5 seats added for Friday and Saturday’s $550 NL Holdem – $200,000 Guarantee tournament. To watch the final table of the $50,000 guarantee, find more pictures from the Pokerati game and more stuff, be sure to hit www.detoxpoker.com. UPDATE: Day 1 of the Main Event will play 60 minutes of level 5. The 90-minute dinner break will take place at the end of level 3. The World Series of Poker, to most people who don’t follow poker, finally gets underway this afternoon with day 1a of the $10,000 No-Limit Holdem World Championship, better described as the Main Event. A field of 6,500 players are expected to show up at the Rio in Las Vegas, seating themselves at tables in the Amazon and Pavilion rooms, hoping their two chips and a chair will turn into something much larger over the next 12 days when the last 9 players return in November to play down to a winner. The main concern for this year’s Main Event will be if Thursday’s day 1d, which had the highest number of pre-registered players, may mean some players could be shut out. Throw in the schedule (four two-hour levels scheduled for each day 1), and it’s possible not enough players will be eliminated on days 1a and 1b to accommodate the much larger fields expected for days 1c and 1d. While the Main Event gets underway today with updates at PokerNews and wsop.com, or follow Pauly’s live blog. There’s still two more bracelets to be awarded today along with the rest of Sunday’s action. The final table of the $10,000 Pot-Limit Omaha Championship concluded with Daniel Alaei defeating Miguel Proulx heads-up to win $780,599, along with his third career WSOP bracelet. Proulx, winner of the $2,500 PLO event earlier this WSOP, collects $482,265 for the runner-up finish. Full results and Nolan Dalla’s tournament report coming soon at wsop.com. The final day of the WSOP Tournament of Champions concluded with 1996 Main Event winner Huck Seed defeating Howard Lederer heads-up, winning $500,000. 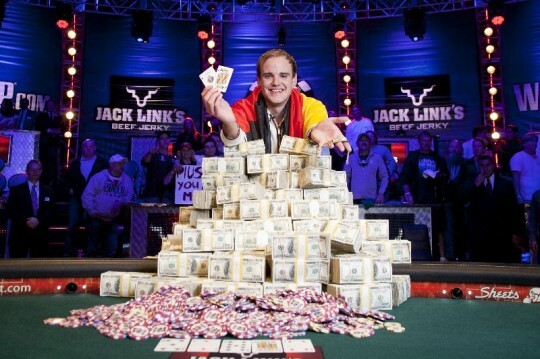 Lederer adds $250,000 to his results, with Johnny Chan earning $100,000 for third. Full results at wsop.com. Note: At the time of this post (6:00am PT), registration is temporarily closed for days 1c and 1d of the Main Event. A busy 4th of July awaits the WSOP with three bracelet events and the Tournament of Champions finishing today, maybe. It’s an early day for the remaining 17 poker celebrities as the WSOP Tournament of Champions plays down to a winner starting at 11am. Mike Matusow will lead the field with 85,500 in chips when play gets underway, follow the gripes, complaints and other action around the felt at PokerNews. Day 3 of the $1,000 No-Limit Holdem is scheduled to play down to a final table when play resumes at 3pm. David Peters leads the remaining 47 players with 594,000 in chips, with bracelet winner Jesse Rockowitz (320,000) and Alex Jacob (163,000) among the notables remaining. The full list of chip counts and results are at wsop.com. Day 3 of the $2,500 No-Limit Holdem finds 73 players returning at 3pm, attempting to reach a final table. James Mackey (1,011,000) holding a large chip lead over the field. 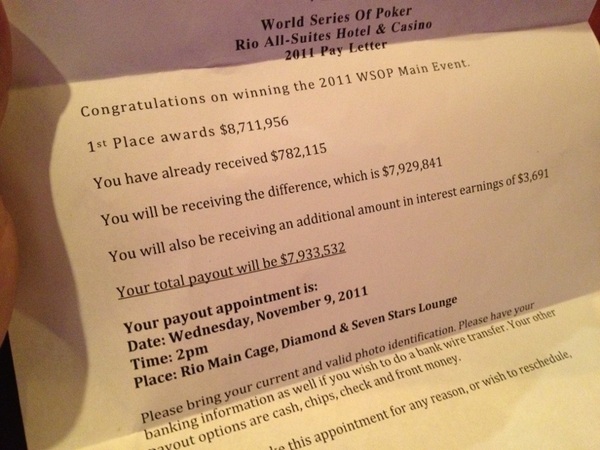 Other notables who come back to the Rio include Mike Wattel (428,500), Jon Turner (288,000), Dan Shak (215,500), Isaac Baron (194,000), Craig Marquis (152,000) and Court Harrington (145,000). Full chip counts and results available at wsop.com.